Anyone can learn to teach their horse to bow--both curtsy bow and one leg bow-- lie down and the impressive Spanish Walk. 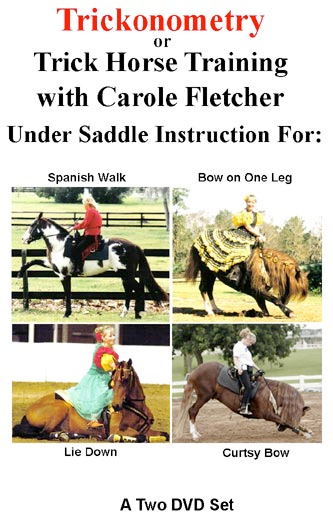 This 2-DVD set, has 90 minutes of instruction in performing these fabulous movements from the saddle. With positive reinforcement methods and tips from Carole Fletcher, you can eliminate the guesswork, enhance your relationship with your horse, and show off his (and your) talents by performing these spectacular tricks. exhibitions around the country, as well.